The worst mistake I ever made online was searching for a bow tie. In a world where credit card numbers and identities are being stolen en masse, that probably seems pretty innocent. Outside of the occasional danger of credit card fraud, online shopping is usually a fairly safe activity. Unless you happen to be shopping for a bow tie. Let me explain. 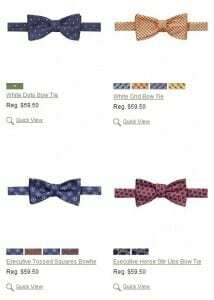 Several months ago I searched online for a bow tie to get an idea of design and price. Later that day, I went to purchase one in a store because I had waited until an unreasonable last minute and needed one right away. A day later the adverstalking started. Adverstalking = Being constantly targeted online by advertising and promotions for products you searched for but did not purchase. In my case, the adverstalking consisted of 3 weeks of non stop targeted ads about bowties and formal wear that would show up on multiple sites that were all syndicating ads. Currently, I’m experiencing the same type of adverstalking from a hotel group in Dubai after a single search for hotels in the region for an upcoming trip. Yet what I (and many consumers) might call “adverstalking” actually has a different name in the online marketing world. We marketers call it retargeting. And retargeting solves a big marketing need to reach highly qualified consumers who searched for a particular product online but chose not to purchase. So, as the research shows, if you can present this person with a targeted ad for a product similar to what they searched – you are much more likely to convert them to purchase. And the numbers show that it works. No context in real life – In my case, I had already purchased the product in question and was highly unlikely to buy another. So all the marketers paying a premium for retargeting were wasting their time and money – because I was almost 100% unlikely to purchase no matter how great their product or price was. Now multiply this wastage by how many other consumers may be in a post-purchase situation where they have already made a purchase in real life or on another site. Fuels privacy paranoia – One of the trends from my 2014 trend report was on “privacy paranoia” – the increasing fear consumers have of how their data is being collected and used by companies and governments online. Adverstalking fuels this paranoia by offering a highly visible example of how browsing behaviour is being tracked and used. The more paranoid consumers are about personal data, the less likely they are to continue to share it or trust the web. Reducing trust in browsing and discovery – The biggest issue is that there may be unexpected behavioural toll from adverstalking as well. Imagine if you knew that every time you walked into a retail store and happened to pick up an item, you’d get ads nonstop for weeks after touching the product inviting you to buy it. It might cause you to browse and discover new products more hesitantly, or not at all. The forgotten truth is that consumers don’t want to buy everything they look at online. Adverstalking assumes they do. So the next time you consider launching a big retargeting effort – make sure you have a simple way to avoid turning into an adverstalker in the process. Give your customers a mute button or another way to opt out. Let them turn down your follow up gracefully – instead of being forced to ignore a barrage of retargeted ads promoting something they are highly unlikely to buy. And if you happen to sell formal wear – don’t forget about last minute buyers like me. By the time you’re retargeting and adverstalking us – we already bought our bow ties out of desperation somewhere else.